It says a lot about Daniel Radcliffe’s screen career that portraying a hyper-flatulent corpse in the way-out-there indie flick Swiss Army Man, written and directed by the duo of Dan Kwan and Daniel Scheinert, only counts as the second most memorable role he’s ever played in films. Radcliffe’s character, Manny, may have expired, but is hardly motionless in Swiss Army Man. In fact, Manny may well be screendom’s most active non-zombie corpse since the heyday of Weekend At Bernie’s. Co-star Paul Dano learns to harness and use Radcliffe’s postmortem expulsions, even riding the body across the water like a jet ski. 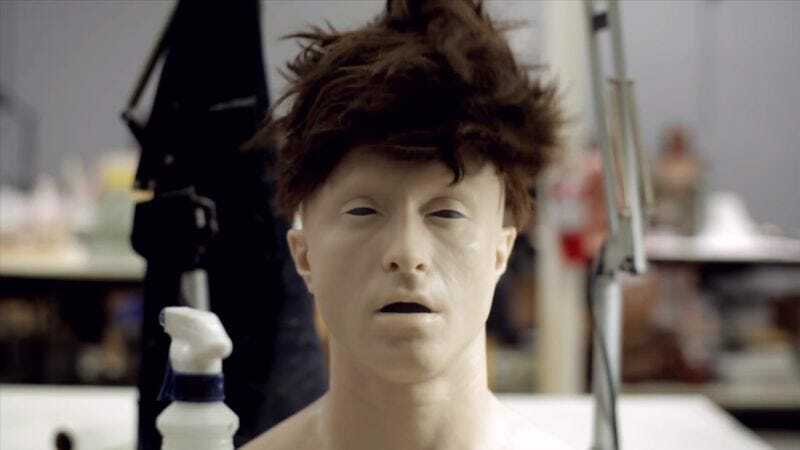 Celebrity trick corpses don’t exactly grow on trees, however, so Kwan and Scheinert turned to makeup effects expert Jason Hamer to create Manny. An artfully made featurette captures his process. For Hamer, the project offered such challenges as “building a body that can hold another body and is compelled by farts.” One believes the artist when he says that this has never been done before. The real, living Radcliffe must have taken a shine to Manny. The two have become fast friends, even going out on tour together to promote the film. Were it not for the mannequin’s glassy stare and sallow complexion, these two would be exact twins. One only hopes that the Manny corpse is forevermore kept in a safe place under lock and key. Should it fall into the wrong hands, like those of a lonely and misguided J.K. Rowling superfan, the results could be cataclysmic. And just imagine the ruined childhoods should Manny be spotted at The Wizarding World Of Harry Potter. Just to be extra cautious, the only fitting resting place for this particular prop is the warehouse from the ending of Raiders Of The Lost Ark.